Please refer to our stock # FIG61 when inquiring. 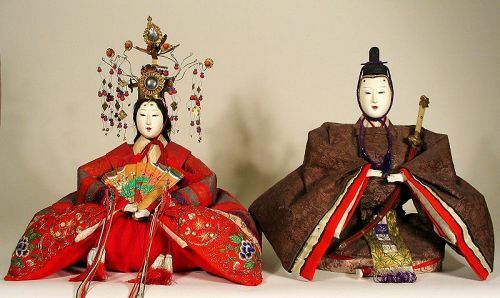 DESCRIPTION: A pair of large Japanese Emperor and Empress dolls, or kokin-bina, presented in formal court dress. The empress’ attire is quite elaborate, using fine brocade silks with hand embroidered flowers. In her hands she holds a painted fan and is crowned with an elaborate headdress representing a bird with long hanging beads attached. Both dolls have gofun faces and hands, which are in excellent condition. The accessories include the empress’ crown and tasseled fan, and the emperor’s long sword with shagreen tsuka (handle) and traditional black hat. Meiji period, c. 1868-1912. CONDITION: Fabrics are bright and in generally fair condition for both dolls; there is some scattered fragility with some fabric including the cummerbund fabric on the emperor’s back. DIMENSIONS: With accessories, the emperor is 12” high (30.5.cm); empress is 13” high (33 cm). HISTORY: Every year on March 3rd, Japan celebrates The Doll Festival (Hina Matsuri), and until recently, this date was also Girl’s Day. On this day, families set up a special step-altar on which to arrange their dolls. They would decorate this altar with boughs of peach blossoms and make offerings to the hina dolls of rice cakes (mocha), either flavored with a wild herb or colored and cut into festive diamond shapes.